On Monday night I spoke at the inaugural meeting of Hacks/Hackers Canterbury. Here is an essay version of my talk. 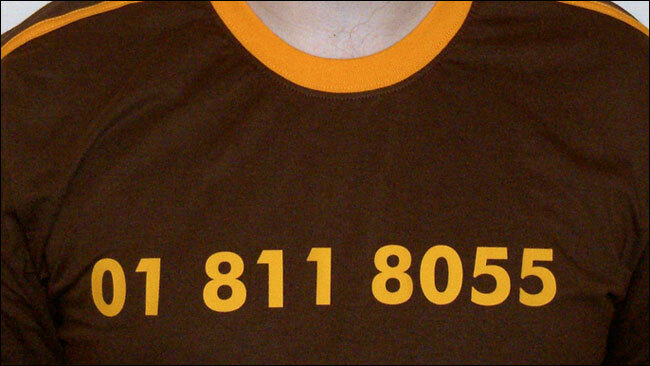 I’ve started talks before with a picture of Dan Catt’s t-shirt emblazoned with the number 01 811 8055. It is the magical phone number that in the late seventies and early eighties could connect you to pop stars and TV personalities on Multi-Coloured Swap-Shop. It is seared into the minds of British people of a certain age and demographic because it was about the only way that you could directly interact with the stars. In fact, when he worked for Flickr in the US, Dan used it as a short-hand way of signifying he was British to any other Brits in the room. I always use it as an example of how interactivity has changed for media organisations. From the humble beginnings of a few phone calls and “Letters to the editor”, a whole new ecosystem of interactivity has arisen. I wrote for the BBC Internet Blog back in 2007 about the growth in emails and messageboards and blogs, and the article already sounds positively stone age. It is all about the BBC hosting and controlling conversations, whereas now they have moved to sticking hashtags like #jools on screen, and David Dimbleby promising that techies are working towards adding an on screen Twitter-stream to BBC Question Time. As well as a growth in interactivity, the last ten years have seen the slow but inexorable rise of mobile. I feel like nearly all of my career people have been telling me that “next year” is definitely going to be the year that mobile breaks through. In the early 2000s I eagerly learned WML, thinking this would future-proof my meagre coding skills. How wrong I was. This year though does look like finally being a key year. I recently saw Tom Betts of the Financial Times showing this graph of comparative platform usage of their site. 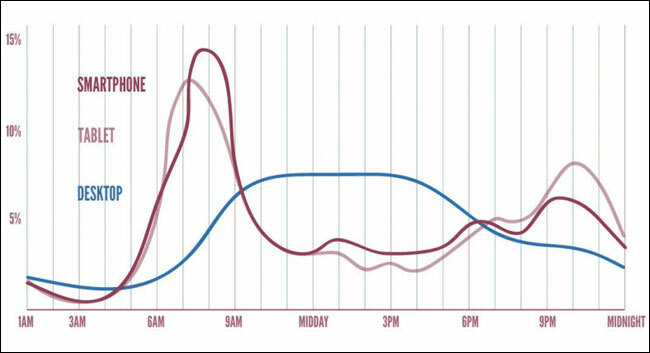 The curves tell the story of the day - people look at their tablets over the breakfast table, consume more news on their mobile during the commute, then settle down to the chains of the desktop computer during office hours. A quick snack of news on the mobile on the way home, and then they finish off the evening on the sofa using the tablet again. 4G technology promises to skew usage even further away from the desktop. Major consumer launches of network level telecoms infrastructure happen roughly once a decade. Apple have been rapped on the knuckles for prematurely advertising the new iPad as a 4G device, whilst we await the roll-out of the network in the UK. It promises even faster, ubiquitous connectivity. But I also think it will open new digital divides in the UK between the news industry and the audience, and between sections of the audience itself. Before looking at the new digital divides, I want to remind you of the two principal digital divides over the last decade. The first was the take-up of digital television. You may recall that society was going to go into complete meltdown as the analogue television signal was switched off, and nobody in the country knew how to get pictures ever again. Whilst some newspapers still try to spin a story out of “BBC moves Blue Peter from one channel most people can receive to another channel most people can receive”, the sky did not actually fall on our heads. The second divide still exists, and will continue have a financial impact on the UK. Late last year the Office of National Statistics reported that 17% of adults in the UK have never been online, which amounts to around 8 million people. This is a challenge for people like the Government Digital Service, who are committed to driving efficiency savings for the taxpayer by moving transactions to digital. Savings are hard to find if you need to continue to run a parallel paper process to ensure compulsory interactions are still available to the offline community. I believe the introduction of 4G technology will exacerbate existing digital fault lines, and create new digital divides in four areas. When telcos roll out the new services, if history is any guide, a wave of early adopters will rush to the new technology, which will be slightly over-priced as they keep a keen eye on recouping the money they spent on the spectrum auction. After that there will be a second wave of enthusiastic adopters - I’ll be in that bunch. However, considering that many existing smartphone contracts run to 18 or 24 months, and that many people will be on upgrade cycles that mean they sign up for new contracts before 4G is rolled out, it could potentially take as long as three or four years before the majority of smartphone users in the UK are on tariffs that give them affordable access to the benefits of 4G. One thing that can’t go out of fashion soon enough for me is ordering a coffee, then sitting down in a Central London location to discover that neither my phone nor my mobile broadband dongle will connect to 3G on the three different networks available to them. Our children will laugh that you could ever be offline. Nobody is investing significantly in 3G roll-out anymore because of the impending shift to 4G, but it can hardly be said that the whole country has 3G. Three are the network that claims to have the most coverage, and a quick look at their map shows you how relative “most comprehensive” is to “universal coverage”. 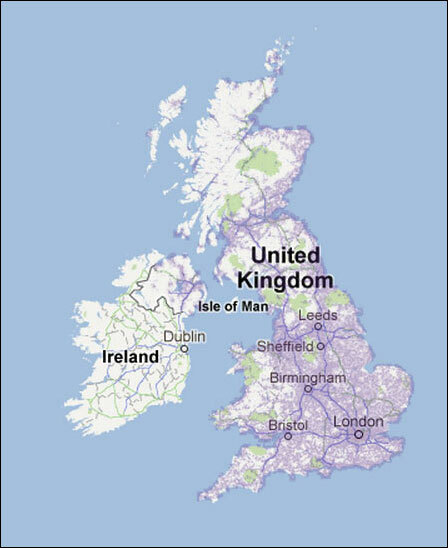 Three’s 3G coverage map. Will 4G penetrate any further? 4G will only intensify the gaps in coverage, and services will need to be designed to accommodate an increasing array of bandwidths. Travelling from a transport hub in London to a similar urban northern hub will almost certainly necessitate travelling through dead-spots of 4G, 3G and even the age-old 2G signal. News organisations also need to consider international distribution. The idea that you were just a newspaper for one region, or a publisher for one country is dead and buried. Everybody publishing digitally publishes globally. So you need to think of the technology profile of your potential global audience. Guardian journalists were very proud of the way that live blog coverage told the story of the Egyptian Arab Spring revolution, and anecdotally people like Chris Elliott have brought back stories of it being influential on the ground in Cairo. However, I look at the feature phones being held aloft in Tahrir Square, and at the download sizes of the Guardian’s live blogs, and wonder how much of that content was actually deliverable on those devices. Testing mobile pages on fat 4G connections in offices in London will give you no idea of how the service is actually being experienced in Beijing, Cairo and Mumbai. 4G opens up news organisations to two innovation risks. The first is that competitors innovate faster than you do. This might be particularly felt in the regional and local press - where for users of adjacent areas of coverage one group might be noticeably more proficient at taking advantage of 4G services. The greater problem, as ever, will be disruptive innovation from outside the traditional set of media competitors. Google, Facebook and Twitter did not start of as media companies, although you would certainly classify them as that now. The simple maths is that from a nation that back in the 1970s only had three broadcast TV channels, we will be in a position where millions of people will be carrying around with them broadcast ready equipment. The sheer scale of the audience means that there will be more people at a major sporting event with the means to take pictures and instantly upload them, or broadcast streaming video, than there are sports journalists in the whole of the UK. Audiences can also cover niche topics better than the media. The old bundle model of the newspaper was a string of niche interests covered in a generalist way. Enthusiastic followers of any hobby, passion, or industry vertical, are able to produce content with a higher level of expertise than the humble desk journalist, and they will be able to do it in an increasingly mobile fashion. And they can publish faster than us. I saw a tweet from @JemStone that he’d heard about one of the goals in the Euro2012 final from a tweet by Stan Collymore three seconds before the BBC HD feed showed the goal. Think about that for a second - from the Ukrainian telcos, to some servers on the west coast of the US, back to a screen in the UK, faster than the BBC can transmit pictures. And that is before 4G arrives and speeds up some of those links. I think there are three directions that journalists, programmers and designers need to be aware of when preparing and building services for the 4G decade. Screen-size shouldn’t be the only consideration though. Web content should also adapt to context of use, and, importantly, available bandwidth. It is no use automatically assuming because I am on my phone that I am scurrying to catch a train and need a stripped down experience - I’m just as likely to be surfing from my sofa because it is less effort to pick up my phone than stretch a couple of metres for my laptop or tablet. We need to design defensively for the web. It is always great fun drawing out the “happy paths” through an app or service, but the true user experience unfolds in the moments when the user is stuck in an “unhappy path”. I’m having a nightmare with the official Tour De France app, which keeps stalling on the splash screen saying I need a network connection to run the app for the first time - even though I have a network connection and it isn’t the first time I’ve run the app. Meanwhile it is set up to give me push notices, and is spamming me with spoilers for the stage results which I can’t get through to the settings page to turn off. And I paid for it. This kind of user experience shouldn’t be possible. When building an app or service, think about how it behaves when signal drops, or when an API it relies on is absent, and design for those occasions. By journalist-centred design I don’t mean getting the journalist to tell you that your product should be blue and that the buttons button should be in the top right-hand corner. I mean looking at the tools you give journalists to do their job. When Tumblr built their app for the iPhone they concentrated on building the fastest and easiest to use way of publishing onto the web. When most publisher CMSs were developed, they were built with the aim of proving to the enterprise software IT bods that the software is secure and scales - not that there is a great authoring experience for the end users. In the past I’ve videoed journalists trying to use the Guardian CMS to try and capture some of the problems they are experience, and one of my last projects there was to work on a re-build of the Guardian’s live blogging tools to streamline the publishing process. Hacks/Hackers Canterbury is a new chapter of Hacks/Hackers in the UK, being run by Tom Foster, aided and abetted by Lizzie Hodgson. They are looking for speakers for the next few months, so if you are in Kent, or fancy shifting yourself down from London on the super-fast Javelin train, then follow @HacksHackersCTB and get in touch with them to volunteer your services. By Martin Belam on 4 July 2012.